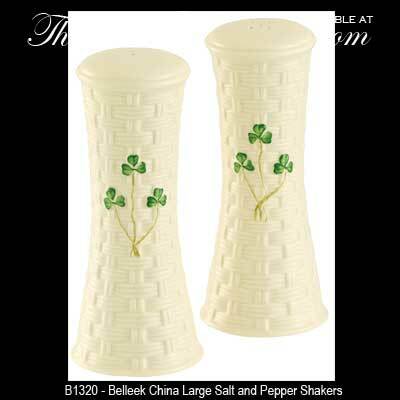 This tall set of Belleek salt and pepper shakers are enhanced with hand painted green shamrocks on fine Irish china. These Belleek salt and pepper shakers were introduced in 2014. The Belleek salt and pepper shaker set features hand painted shamrocks and measure 6 1/4" tall x 2 5/8" wide. These Irish salt and pepper shakers are hand crafted in Belleek, Ireland and are gift boxed with a shamrock history card that is complements of The Irish Gift House.